When you think of the quintessential well-established, luxurious Carolina Forest community of Myrtle Beach, Waterford Plantation should come to mind. If you love to hit the links or prefer a peaceful retreat amid the nature preserve, this community of 350 custom homes and home sites is for you. Waterford Plantation is less than a decade old, yet it's embellished with mature shade trees and lush landscaping for you to enjoy. A quiet section of Carolina Forest, some of the homes back up to a large nature preserve. Depending on your dream home plans, you can buy a large lot surrounded by nature trails and private parks to build on or choose a fabulous home from the current inventory. There's no rush to build once you've purchased a lot and you can bring in the builder you prefer. 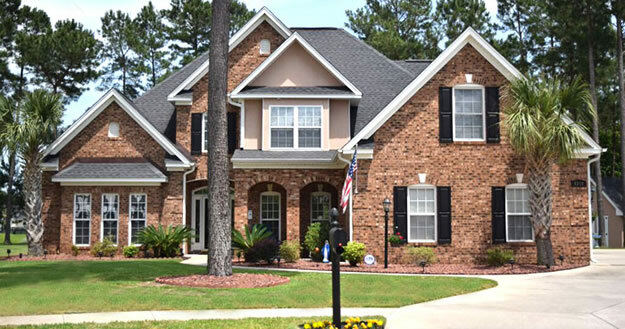 Read more about Waterford Plantation real estate. This true natural beauty offers luxuries such as a clubhouse with a state-of-the-art fitness facility, an enormous, Olympic sized pool, and tennis courts to enjoy. There are also basketball and volleyball courts and a playground. Several home sites are larger than your typical Myrtle Beach area lot. The homes in Waterford Plantation were built with upgrades in mind for its 3, 4, and 5 bedroom floor plans. Homes here range in size from approximately 1,200 to nearly 4,000 heated square feet. Waterford Plantation is in the fabulous award-winning Carolina Forest school district and minutes away from healthcare facilities, shopping, and fine dining. Many homes within Waterford Plantation, within Plantation Oaks, overlook the fairways and greens of the Man o War and Wizard golf courses.